Dany is a Belgian Pet Behavior Counsellor. He helps families with the behavior of their dog or cat. This can be all sorts of behavior that people have difficulties to live with, like: house soiling, barking, biting, destroying furniture, aggressiveness, jumping on people, digging, etc.. Dany has more than 35 years of experience in this field. Dany is well known for his knowledge. 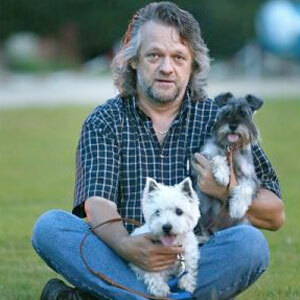 He was several times on Belgian Radio and he had his own program about Dogs and Cats and their behavior on the Belgian National Television. So far Dany wrote 4 books about dog & cat behavior, and hundreds of articles for doggy magazines. Dany is a speaker at international seminars. He was invited in countries as far away as the US, Canada, Iceland, Japan, etc. Because of his massive experience Dany is also often asked as an adviser by local and federal governments. He was for example advisor for the Belgian police. Dany created the Belgian Centre for Guidedogs, to help out visually impaired people with a guidedog. Helping people and pets to live in harmony is Dany’s mission. That motivates him to help out Dogshelters in setting up matching procedures and training the volunteers and caretakers. For contacting Dany you can either phone him +32 475 97 10 11. or use the contact form. Dany does consultations at his place in Heusden-Zolder, Belgium, or at the petowners home.